It was warm enough for us to eat outside in the garden yesterday evening but this morning, we woke up to the unmistakeable sound of rain pitter-pattering down rather ernestly. For a moment or two, I felt like I could almost be in Ireland. Almost. Still, we were now all confined to the indoors until whatever time after lunch when we’ll leave for Paris. I took this time to properly explore the house that we’re staying in. 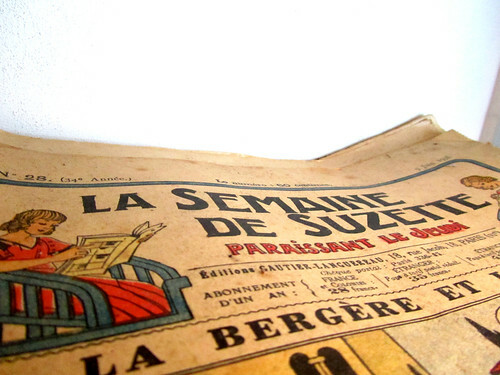 It is akin to Aladdin’s cave, with wondrous stuff here and there, from a mask made to resemble the face of an owl to really old publications such as this – La Semaine de Suzette (click linky for more info about the weekly paper). There were also vintage hats and Nancy Drew book series and old maps of Nantes and x-ray images – quite a veritable mix, isn’t it?